Designed to hold mats with eyelets with a hole diameter greater than 2cm. 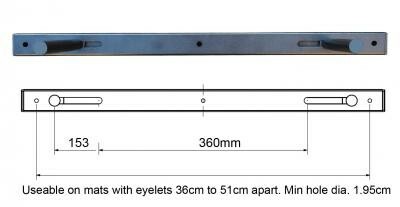 The bars can be adjusted from 36 cm to 51cm apart (centre to centre) and are suitable for mats with eyelets of 1.95cm or larger. The bars that secure the mats are 21 cm long and on a suitable wall can hold up to 15 x 10mm mats or 10 x 15mm mats.